Those of us involved in training-teaching-learning viscerally understand the power of a good story and the value of a good storyteller. So when New York Times columnist Bob Herbert left the newspaper in 2011 to accept a position with the public policy organization Demos, some of us felt as if one of the great storytellers in American journalism was vanishing—and that our world, consequently, would be a bit less vibrant. Herbert’s writing in the Times was always strong, passionate, inspiring, and laser-sharp in its focus on stories that provided context and gave meaning to the overwhelming flow of reports that inundate us day after day. His final column (“Losing Our Way”), in fact, began with the observation “So here we are pouring shiploads of cash into yet another war, this time in Libya, while simultaneously demolishing school budgets, closing libraries, laying off teachers and police officers, and generally letting the bottom fall out of the quality of life here at home.” Those words provided a searing reminder to that learning, libraries, and involvement in the setting of public policy are integral parts of the overall responsibility each of us has to actively working to create the world we would like to have. It’s a pleasure, therefore, to find that the storyteller has returned with a book that effectively and engagingly expands the thoughts included in that final New York Times column—Losing Our Way: An Intimate Portrait of a Troubled America—and continues what he has occasionally produced via columns for Demos. 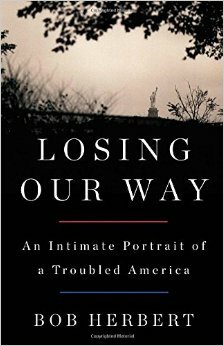 Losing Our Way focuses “most intently on four specific areas: the employment crisis, which was badly underestimated and poorly understood; the need to rebuild and modernize the nation’s infrastructure and the relationship of that vast project to employment; the critical task of revitalizing the public schools in a way that meets the profound educational imperatives of the twenty-first century; and the essential obligation that we have as rational and civilized beings to stop fighting pointless and profoundly debilitating wars,” he tells us in his introductory author’s note (p. 6). And when we move into the realm of learning, via an exploration of what is happening in our public schools, we don’t simply rehash the failed policies that, according to Herbert, have undercut rather than enhanced our educational system; we see how individuals including Jessie Ramey and Kathy Newman, in Pennsylvania, refused to accept billion-dollar cuts to educational programs and, through hard work, created partnerships that drew attention to the human cost of those reductions. “The United States needs to be reimagined…” Herbert writes at the conclusion of his book. “Ordinary citizens far from the traditional centers of power…profoundly changed American society. Through sustained, thoughtful, and courageous efforts they…shifted the nation onto a better path. A comparable effort by ordinary citizens is needed today if the United States is to regain its great promise of fairness and opportunity for all” (pp. 245, 247). As I sit here in Chicago, about to join colleagues for a variety of discussions at the American Library Association Midwinter Meeting, I think about Herbert’s earlier references to the closing of libraries, about the challenges we face in providing effective learning opportunities, and about his call for reimagining the world around us—and I think I couldn’t be in better company to explore what training-teaching-learning, effective collaborations, and engagement in active communities of learning and communities of practice can produce. This entry was posted on Wednesday, January 28th, 2015 at 10:21 pm and is filed under leadership, writing. You can follow any responses to this entry through the RSS 2.0 feed. You can leave a response, or trackback from your own site.